The stretchable flaps use electroadhesion to accomplish their goal. École polytechnique fédérale de Lausanne's (EPFL's) new robotic grippers don't look anything like fingers, but they can pick up even delicate objects like eggs. Their secret? Electroadhesion. That's the same phenomenon that makes a balloon's surface sticky enough to adhere to a wall when you rub it against your hair. 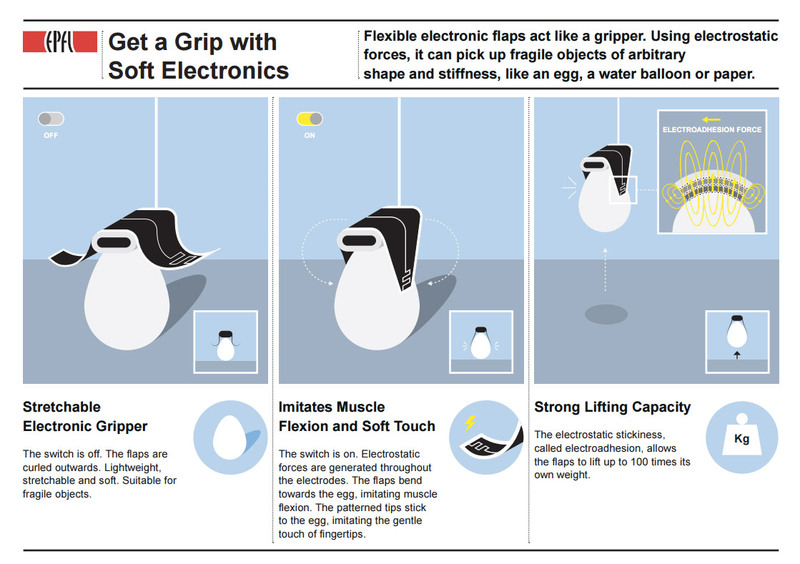 The EPFL's grippers are flexible and stretchable electrode flaps that act like a thumb-index finger combo. Electroadhesion allows the soft grippers to carry up to 80 times their weight, so the technology has a promising future ahead. The EPFL scientists believe it could be used not only for prosthetics, but also for food factories and even to capture debris in space. Since we most likely won't see the flaps in the wild anytime soon, check out the video below to see them in action.